Now for Part Two! The Sunshine Award! What a great name, ‘The Sunshine Award’. I love all that it means metaphorically (awarded for writing positive and inspiring articles and so bringing some ‘sunshine’ into the lives of others) as well as, quite literally, coming at the perfect time when that old sun is at last shining down on us here in Blighty, warming us all up and bringing with it a renewed optimism, a burst of energy and a lightness of spirit. Please know that I take none of this lightly, never having had any expectation of receiving any awards, nor even really knowing about them until recently to be totally honest. So, when my ‘blogging buddy’ Beverly Harvey nominated me for this award, she certainly gave me extra reason to smile! She has a wonderful blog called Moggiepurrs, a beautifully written blog all about cats (all you cat lovers out there, run, don’t walk to this blog) but she is also quick to offer advice for new bloggers with news of competitions and great ideas to help fellow bloggers expand their blogs. She has been very encouraging and supportive of my writing from day one more or less, so a huge thank you Beverly for this and for bringing me some extra sunshine today! Rule 1. 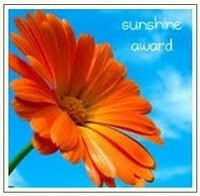 Post the Sunshine Award logo on your blog (makes me smile just to look at it!). Rule 4. Mention links back to their blog, including a link to the person who nominated you. Rule 5. Answer the questions. This is designed to help people get to know you better. 1. http://traveltimetalk.com/ Beautiful travel blog with gorgeous photos. Arianna Elise, a young college student eager to travel the world, inspiring us to ‘think outside the box’ when traveling. 3. http://tomculver.me/ Gorgeous photographic blog capturing nature in all its glory. 4. http://unshakablehope.wordpress.com/ Truly inspirational blog in the face of adversity, beautifully written, you will be richly blessed when you visit this site. 5. http://noordinaryjoy61.wordpress.com/ Wonderfully written blog about seeing the lessons in everyday life. 6. http://citizengallagher.wordpress.com/ To give a little sunshine. 7. http://choppingpotatoes.wordpress.com/ An exquisitely written blog about a lovely mum’s challenges and victories. 9. http://mvschulze.wordpress.com/ ‘Preserving and capturing moments’ is the premise of this fascinating blog. 10. http://rachelmankowitz.wordpress.com/ Lovely blog by a writer who just happens to love dogs! That’s easy too – a chilled glass of champagne, what else? Facebook, I don’t do Twitter. My family & good friends, my home & garden, walking, new adventures when possible, wildlife, travel (again, when possible) great music (see below), dancing, and of course writing and this blog. Anything I like I’m passionate about actually! 8. Giving or Receiving Gifts? Got to be Mad Men. So that’s it! Phew! Now I just have to let you all know. This entry was posted in Awards and tagged Awards, The Sunshine Award. Bookmark the permalink.